"As an ammunition train was pulling into a station in Cambridgeshire, the driver, Gimbert, discovered that the wagon next to the engine was on fire. He immediately drew Nightall's attention to the fire and brought the train to a standstill. By the time the train had stopped the whole of the truck was enveloped in flames and, realising the danger, the driver instructed the fireman to try to uncouple the truck immediately behind the blazing vehicle. 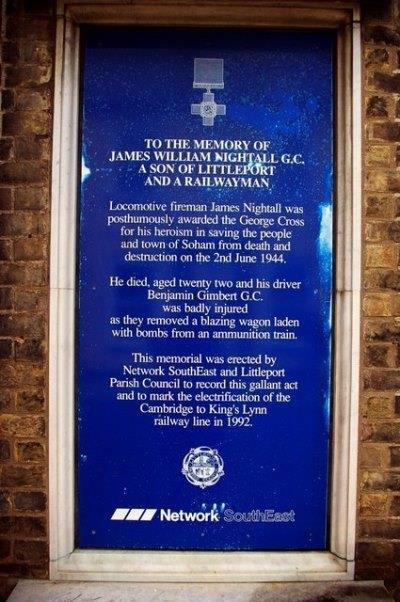 Without the slightest hesitation Nightall, although he knew that the truck contained explosives, uncoupled the vehicle and rejoined his driver on the footplate. The blazing van was close to the station buildings and was obviously liable to endanger life in the village. The driver and fireman realised that it was essential to separate the truck from the remainder of the train and run it into the open. Driver Gimbert set the engine in motion and as he approached a signal box he warned the signalman to stop any trains which were likely to be involved and indicated what he intended to do. Almost immediately the vehicle blew up. Nightall was killed and Gimbert was very severely injured. Gimbert and Nightall were fully aware of the contents of the wagon which was on fire and displayed outstanding courage and resource in endeavouring to isolate it. When they discovered that the wagon was on fire they could easily have left the train and sought shelter, but realising that if they did not remove the burning vehicle the whole of the train, which consisted of 51 wagons of explosives, would have blown up, they risked their lives in order to minimise the effect of the fire. There is no doubt that if the whole train had been involved, as it would have been but for the gallant action of the men concerned, there would have been serious loss of life and property."